I didn't plan to make any kyaraben bento for this morning. So I just did a simple and quick bento. I made this after dropping the kids to the school and sent the bento one hour before the lunch time started. I got my new food picks from J-Mama online store last week. 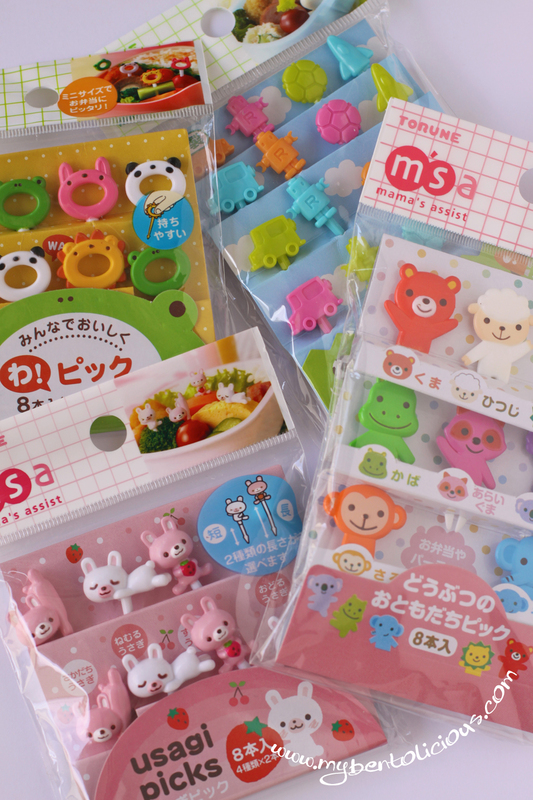 I love her online store with a lot of cute stuffs that I can use for my bento making. I bought from her online store several time and the service never lets me down so far. If you are in South East Asia and looking for a cheaper shipping fee to your country, J-Mama is the best choice. 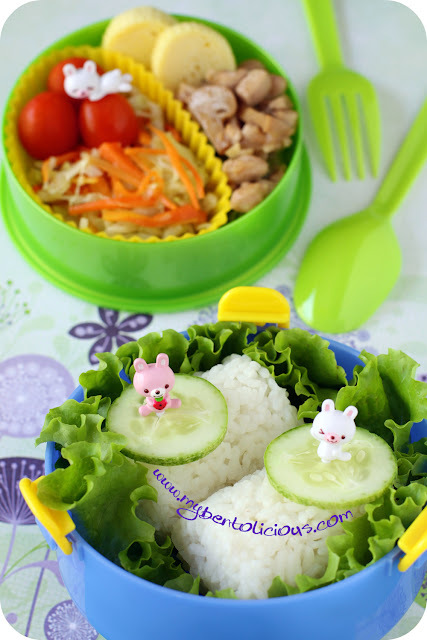 The rabbit food picks are so cute that I decided to put it on the top of the rice for quick fixed bento. Inside the boxes : 2 big hand molded onigiri, tamagoyaki, sauteed chicken & mushroom, cherry tomatoes, and stir fry cabbage & carrot. I love the big O picks.. so cute. Simple and yummy bento Lia! @Bobo : Yes, so cute right? hello Lia! it's been a while since I last left a comment on your beautiful kyaraben creations. The color green is so vibrant and it really made your bento look so appetizing. Awww and tey are really cute food picks. I love it! @Rio : Thanks a lot Rio! Happy to read your comment :) You can get those cute picks from J-Mama too. The bento is simple but the bunnies makes it very special! Bento picks FTW! Have a great week Lia! Non kyaraben but still so cute! The the food picks are really cute, especially the bunny one! Awww, if I had those picks I would never have to think of a cute bento idea again. Those colorful animals are the cutest ever! Love those food picks, so cute! Simply adorable and elegant bento, Lia! The soft bright colors are so uplifting. As are the new bento picks, awesome! @karaimame : Thanks a lot Lilian! The cute picks can be used not just for bento, that is another reason why I love to collect them :) Have a great week too! @KidsDreamWork : Food picks are really the life saver for quick fixed bento. Thanks a lot Ai Ping! @anna2003 : Grab them now, too cute to say no hehehe ... Thanks a lot Karen! Even your super simple bentos, they look SO pretty and cute Lia! I think even without the cute picks, your bentos would look amazing. Hope you had a great weekend! @ChantaleP : Thanks a lot Chantale! The food picks are so cute!!! Speechless!!! please please please make a post about "bento tools" starter and shop list (online & di Jakarta), where to buy stuffs such natural food coloring, spices, etc. I'm a new "member of house-wife club" and OVERWHELMED with cooking idea!! Please pretty please with sugar on top of it please... T_T' help...anyone?? ?